Gannon University shocked its students by canceling classes for Wednesday and Thursday due to severe cold temperatures. The National Weather Service issued a wind chill watch effective from Tuesday evening through Thursday afternoon. As a result, Edinboro University, Porreco College, Penn State Behrend and Mercyhurst University will be closed Wednesday and Thursday. Many other schools in the Erie and neighboring school districts also began canceling classes early Tuesday afternoon for Wednesday and Thursday. At 4:40 p.m. Tuesday, Gannon canceled all on-campus classes for Wednesday. At 2:29 p.m. Wednesday, Gannon sent an email to students stating that classes were canceled for Thursday as well. It’s the first time classes had been canceled since 2015. However, the university will still be open, and employees should report to work. Faculty and staff should check in with their supervisors to make an alterations to their schedules. Metz also shortened their hours of operations for Thursday. Only Doc’s Landing and Beyer Hall Cafeteria will be open. Doc’s Landing will be open from 7 a.m. until 2 p.m. and Beyer Hall Cafeteria will be open for brunch from 10:30 a.m. to 1:45 p.m. and for dinner from 4:30 to 8 p.m.
Mercyhurst University sent a tweet out Tuesday afternoon that all activities and classes after 5 p.m. Tuesday were canceled. The tweet said, “The safety of our students, faculty and staff is our highest priority. Cold wind chills as low as 25 to 35 degrees below zero may be possible with wind gusts up to 30 mph. 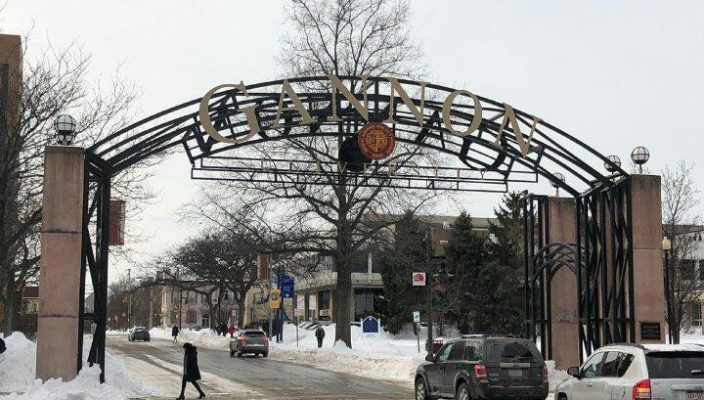 Gannon sent an email to students reminding them that in these conditions, frostbite and hypothermia can occur if precautions are not taken to dress appropriately for the cold weather temperatures. All students, faculty and staff are urged to use caution and personal judgment in their travels. Unless it becomes unsafe for the drivers due to weather conditions, the Knight Watch van will also continue to operate during normal hours. After hearing the news about classes being canceled, students started pondering how they would spend their day. Nicolis Franz, a sophomore digital media communication major, said he is looking forward to not having classes. “I’m likely going to be playing ‘Super Smash Bros.’ all day,” he said. Cytalia Crosby, a junior freshwater marine biology major, said that she should probably dedicate some part of the day to doing homework. “Really, I just want to get my life together,” Crosby said. Molly Cooke, a senior theatre communication major, is a commuter and she said she is excited to stay home tomorrow. “I am going to be in my fluffy pajamas and robe playing ‘Sims 4,’” she said. Abigail Ritchie, a senior communication major, is another one of the many students making some relaxing plans for a day with no classes to attend. “I’m going to bake, probably a pie, and eat it all while I binge watch some of my favorite Netflix shows,” Ritchie said. Danielle Kowalski, a junior interdisciplinary studies major, said that she may just have to wear pants outside tomorrow. Kowalski usually wears shorts because she’s from Buffalo, so the cold temperatures of Erie don’t really faze her. But she plans to take precautions since it will be in the negatives, which is colder than cold. “I’m still going to be walking around campus tomorrow,” she said. Kowalski is planning to make tomorrow a very productive day to catch up, or even get ahead, on some of her school assignments. Medina Klino, a sophomore accounting major and commuter, said that she is going to spend her day at home working on some of her school work. “I hope to practice my accounting problems a few times,” Klino said. Chet LaPrice, operations manager at 90.5 WERG and an adjunct lecturer in the School of Communication and the Arts, said he can remember exactly the last time that Gannon closed due to poor weather conditions — Feb. 20, 2015. “I remember it so distinctly because I wasn’t here,” LaPrice said. Students are remembering that there is still school work to be done even if there aren’t classes to attend, but many are planning to spend their time relaxing inside. For those going out in the cold, they will not forget to dress warmly. The weather is supposed to be nicer this weekend, so look forward to that.